I am still in shock. 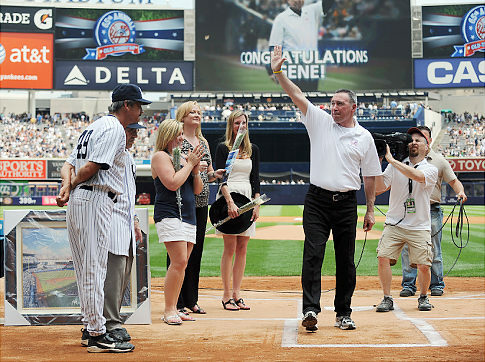 The Yankees actually signed a big free agent! And I am ecstatic! Some think it was a dumb decision, some think the Yanks overpaid, but I DON’T CARE! It just means the world to me that they actually did something – something worthwhile. With this one signing, I feel a whole lot better about next year for my Yanks. The Yankees recently signed former Ray’s closer Rafael Soriano to a 3 year, $35 million deal. Expensive? Yes, but Soriano had a remarkable season in 2010 with a 1.73 ERA and a league leading 45 saves, so I’d say he’s worth it. Who cares if he’s setting up? I hate when people say “Ohh the Yankees are so dumb to pay that much for a setup man.” WHAT’S THE DIFFERENCE? What, like they are going to use Soriano as a closer while they have Mo? Come on. The job of setup man is extremely underrated. It’s incredibly important. And since Soriano was amazing last year, and he said he wouldn’t mind being the setup guy for the Yanks, I’d say he’s worth every penny. 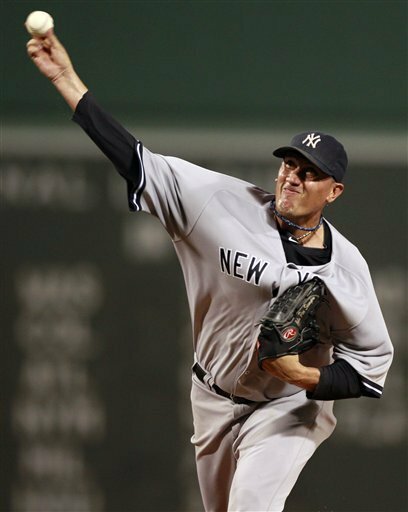 Rafael Soriano makes the entire Yankees pitching staff better. And I know I’m really excited, so that might sound like an overstatement, but it’s really not. Soriano makes the whole bullpen stronger. He has a defined role: he is the setup man, and that’s final. The 8th inning belongs to him. And of course, the 9th is Mo’s. 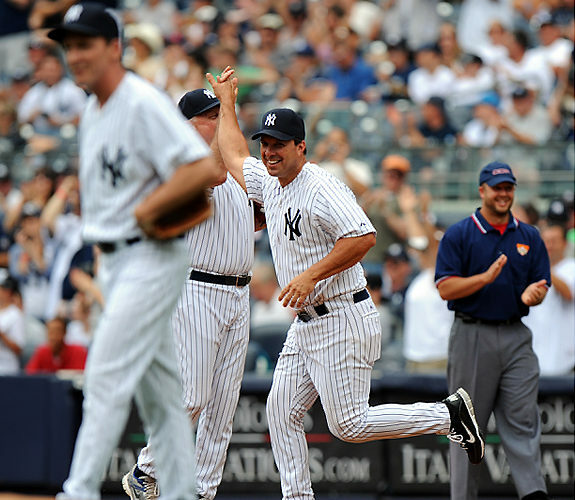 Remember what seems like a long time ago when the Yankees signed Pedro Feliciano? He’s a lefty specialist, which means Boone Logan might be able to pitch full innings, since the Yankees will still have another lefty reliever. So maybe the 7th can be Logan’s inning. What I’m attempting to say, is that the acquisition of Rafael Soriano helps to shorten games. Pitchers, good pitchers, have defined roles. Now, that starting rotation that seems oh-so shaky, doesn’t have to worry about pitching really deep into games. They know they can go maybe 6 innings and still put the team in a position to win. I’d love it for the Yankees to bring in maybe 1 or 2 guys for the starting rotation, but even if they don’t, I’m feeling a lot better about the team. These relievers are going to make the starting rotation better. 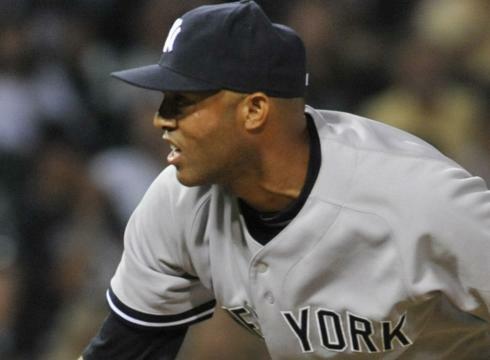 Another reason I LOVE the Soriano acquisition, is because I think he will help Mariano Rivera. Trevor Hoffman, the all-time saves leader, has retired. Mo is second on that list, even though he’s still the greatest closer. Since Soriano is so good, and the 8th inning is pretty much his, he can give Mariano more opportunities to save games, whereas when the 8th inning belonged to Joba Chamberlain, save opportunities were flushed down the drain because Joba SUCKED and blew everything. Mariano has 559 saves, Hoffman has 601. Mo will play for at least 2 more seasons…I’d say it’s safe to say that he will eventually be the Saves King. And speaking of JOBA…I heard the Yankees are willing to listen to trade offers involving Joba if a viable starter looms at the other end of the deal. So that’s good…maybe we won’t have to worry about Joba Chamberlain stinking anymore, because he might not be on the team! A lot has happened since the last time I posted, and I’ve had more than enough time to reflect. Yesterday was Christmas, and all I wanted was some Green Day sheet music and Cliff Lee. I got my music (yay! ), but not Lee…he signed what seems an eternity ago with the Phillies. Little coward…At first I was devastated about Lee, but after awhile I began to think: he NEVER wanted to be a Yankee, so why the heck did I even want him in the first place? Baseball players, especially pitchers, are fragile creatures. If they aren’t happy, they will not be successful. Cliff Lee was to scared to come to NY, so whatever. In other news, I found out on Thursday, December 17 that I was accepted into Marist College and received a hefty scholarship. It was my first and only choice, so thank God I’m in. I hope to Major in Sports Communications. Now that that big weight has been lifted from my shoulders, I can concentrate on more important things, like the blog. Being a nerd, I will still do all my schoolwork, but I won’t have spend as much time on it (it’s time to enjoy senior year). Instead, I will spend time doing fun stuff, like playing piano and putting myself on youtube, learning guitar, and blogging. Although I haven’t blogged in awhile, I have been staying on top of the baseball news. Johnny Damon is available, and I heard the Yankees might be interested in signing him. But I then heard that it will be “unlikely” for the Yanks to sign him. Personally, I’d love to see him back. I was crushed to see him go in the first place. Johnny Damon is a fan-favorite, and I think the Yankee organization owes it to the fans do make a move like signing Damon, especially since they couldn’t make the Lee thing work out. Damon can still play, and if he’s happy (in New York) he will be even better. And he’s such a good clubhouse guy…he might even be able to help straighten out A.J Burnett! I miss his smile, I miss is hair, and I miss his shirtless interviews…Aww, Johnny I hope you come back. I’ve learned this offseason to not take anything for granted. So for now, I’ll just expect NOT to get Damon. So if the Yankees do get him, I’ll be extra happy. 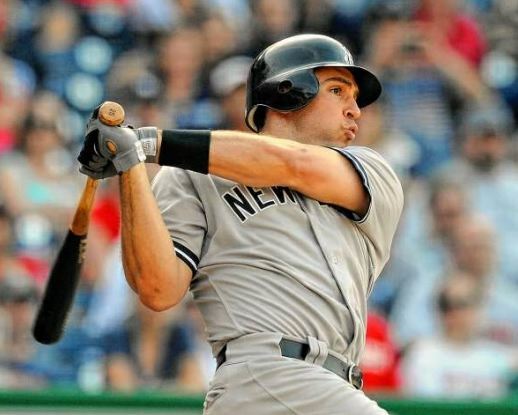 It’s been a pretty dull offseason for the Yankees, minus the whole Derek Jeter saga. 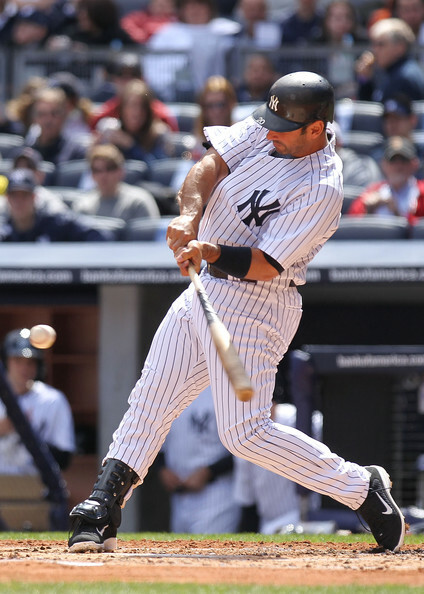 They signed former-Met Pedro Feliciano to be a leftt-specialist with Boone Logan. They also signed former-Dodger catcher Russell Martin, which I don’t like. I mean he’s a fine player and everything, but I’d really rather see Jesus Montero play. I don’t care how “ready” he is. I know the offseason is not over, but I’m just not expecting the Yankees do make any big moves. And with their starting rotation in the shape it is right now, I honestly do not think they have what it takes to contend in 2011. Sabathia, Burnett, Hughes, Nova, Mitre…not too good. So if that is the case, then why don’t they just use Montero? I have been saying it ever since the Yankees missed out on Lee: if they aren’t going to win next year, all I want is to see Jesus Montero, this phenom, get a full year in the Bigs under his belt. If the 2011 season started tomorrow, I wouldn’t expect to win. And I’d be okay with that. I think many Yankees fans, especially ones like me who are 17 years old, have been a bit spoiled: all we’ve ever known are Yankees who win. But every once in a while, even the best teams go through periods where they are not on top. And if 2011 is the start of that period, that’s okay: I’ll still be a fan with things to look forward to, like Montero. I’m just praying that they don’t trade him. Okay Mommy, we’ll see…I think you are wrong. I always liked the Orioles. I always felt that they had some of the cutset players in the league, such as Brian Roberts, Nick Markakis, Luke Scott, and my new favorite Brian Matusz. And when they started playing better, I thought they were even cuter. But they weren’t too cute when they were beating my Yankees. A Yankees loss yesterday would have been devastating, especially since the Yankees haven’t lost 4 in a row yet this year. And looking ahead to the series against the Rangers, I didn’t have good thoughts: I was thinking the Yankees would be swept. Javy Vazquez would pitch game 1, A.J. Burnett game 2. And Moseley, who has been pretty okay, would go up against Cliff Lee in game 3…which hisn’t fair. So if the Yankees lost that finale, that would have made it a 4 game slide…and my calculations of them being swept in Texas would mean a 7 games slide. I don’t want my Yankees to lose like the Padres. The Orioles finale was crucial..a loss in that game would have been heartbreaking….but it wasn’t meant to be. The best part was, my parents didn’t even object. I let my Fan-dom take over yesterday. I skipped for my Yankees. It was crucial that they won. Ivan Nova started for the Yanks, and boy he was good….he’s really something. He made just 1 mistake…and I thought it was going to cost him. With a 3-0 count, Nova laid a cookie right over the plate for Matt Wieters, who didn’t miss it. That 2-run homer changed the whole complexion of the game, and gave the O’s a 2-1 lead. For some reason, Brad Bergesen was unhittable yesterday…6.1 innings, 4 hits, and 1 run, courtesy of a Brett Gardner RBI double. He deserves some credit. 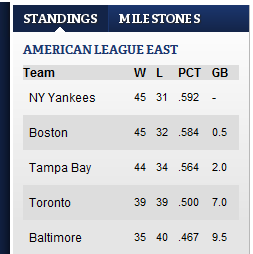 But also, the Yankee bats were pretty dead yesterday. The at-bats were disgusting. The game was a little boring, and honestly, I was frustrated. I was beginning to wonder if I skipped school for no reason. At least the pitching was good. Nova made just that one mistake, but otherwise he was splendid. David Robertson, Boone Logan, and Joba Chamberlain were lights-out. The fact that they were pitching so well gave me a teeny bit of hope that maybe, just maybe, the Yankees would come back. With 1 out, it was Swisher’s turn. He got ahead in the count, just like he always did, and he got a good pitch to hit. And much like Matt Wieters, he was ready for it. Swish put a good swing on it, and drove it deep to left field. Deep….AND GONE! Nick Swisher has 1/2 of the Yankees’s walkoffs this year. That home run changed everything. Watching him round the bases almost brought tears to my eyes. He was limping…his knee still hurts from the other day. He’s so tough, and such a great guy. As usual, Nick Swisher proudly received his pie in the face. He’s enjoying every minute in pinstripes. Nick, I’m enjoying every minute with you. I hope you will be a career Yankee…because I’d hate to see you on any other team. Thank you, Nick Swisher, for this Drama Club win. Hopefully, this is the start of another long winning streak.